Dr. Bob Hayes is the dapper gentleman on the far right. The following is a transcript of a “fireside chat” podcast with Dr. Bob Hayes recorded at IBM InterConnect 2017 in Las Vegas ( USA ). Welcome to the IBM Interconnect 2017 podcast series. I’m your host, Dez Blanchfield, and we’re coming to you from sunny Las Vegas, in the United States of America. I have the pleasure of being here for this podcast with Dr. Bob Hayes, PhD. Now I’m just going to quickly introduce you, Bob, and then I’m going to throw a question to you to introduce yourself. So, your profile online describes you as the Chief Research Officer at Appuri, I’m going to ask you about them soon. You have a PhD in Industrial Organisation Psychology, that’s phenomenal. Your online presence is called Business Over Broadway, which I had a really good look at last night. I read all your blogs. And the website for that by the way if you’re listening is BusinessOverBroadway.com. Check it out, some great reads there. You also listed your key interests and I’m going to rattle these off because they are fascinating: customer experience and customer programmes, in particular the delivery of those programmes by the sounds of things; what works now in best practises based on evidence, which I really want to delve into in a minute; big data on statistics and getting value out of data, and more specifically machine learning, in other words I think you call it stats on steroids. So, Bob, welcome to the podcast and how’s the show going? Are you having fun? I think a couple years, three years. Then I thought, “Wow, I finally get to meet you.” So it’s been a pleasure. It’s great being here. I’ve learned a lot. I met a lot of nice people at IBM and beyond and their partners. And I’ve been loving every minute of this experience. That’s great. We were talking about this earlier on and I’m just going to quickly throw it in. For me, I get the sense at the IBM events that we tend to have more of a human focus, more people focus and the world Watson event last year, which I was privileged to come to and this event, the thing I found is I’m connecting with people, whether I know them online or I just met them here, and I know that’s a really unique experience the last few events that I’ve been to. So, Bob, if you were going to introduce yourself to a complete stranger, and I know it sounds weird, what would that sound like? Well, I’m going to keep this clean. What I would tell them I think is I really enjoy data and analysing data and how people can get value from data. Not just people, but businesses. Anyway you can kind of … in fact, what I love to do is just get data from either free data on the web, data.gov, and start playing with it and see what I can find out. And what’s interesting is that you can look at a sea of what seems like a random sea of numbers, then put structure to that and then get insight out of that. For some reason, that really turns me on. And I’ve noticed this in Australia, and I know it’s a global phenomenon, are you finding that it’s just so much more open data and the data is openly available, that you can tap into post code data, weather data, you don’t have to pay for any of it? In Australia, we’ve got an open data framework that the federal and state government agencies are now legally required to comply with. So any data they can make open, they have to give it away. And I know there’s a similar policy here or plan here. How have you put that to use if you have? Sure, I did a study a few years ago on looking at data from Medicare. What they do is they collect patient satisfaction data on all U.S. hospitals that they give the money. Or they give money to. And so, what I did was I created a visual map of all the hospitals in the database across the United States and colour coded them, green is good, red is bad and so forth. So you can hover over that Google map and see and essentially get your patient satisfaction ratings for your given hospital. So if you live in Seattle, for example where I’m from, you can compare all the hospitals in that city and see which one maybe is best for you. You can look at their patient satisfaction ratings, their health metrics, their process of care metrics, a whole host of metrics they have on various maps on their websites. It’s pretty cool stuff. And what I really like is the Data Science Experience that IBM has, they also allow or provide for 180 data sources you can actually import into your modelling. And it’s growing every day. And I think last time I logged in two days ago when we first got here and had a chance to play, someone actually had an example of a graph database that someone had just put out there and I jumped online while they were at the talk and replayed it, because it was just the URL was there. And I noticed from the time I logged in at the start of the talk to the time I logged out, there was another eight different data sources available I could plug into. I think that’s the power of these tools now, because they’re open source tools. Because the data is sort of there and it’s open, if you build something and you want to collaborate with the world or collaborate with a team, you can just share it and put it out there. So this leads me nicely into kind of what we were talking about before, which is what I referred to as your Aha moment for this week, you’re kind of Eureka moment. You mentioned that there was something in particular with something we went to yesterday that just really grabbed your attention. What was it? Tell us about that. Oh, wow, I saw Rob Thomas, he’s the General Manager for IBM Analytics and he presented his talk on their Data Science Experience. And even though that’s a cloud-based platform, they made an announcement yesterday that they’re going to be offering that on a desktop and that really excites me because I think a lot of businesses are kind of wary of putting their data on the cloud for security reasons. Maybe they’re not an IBM partner. So if IBM can give them that experience on the desktop and have them play with their own data within their walls, build up trust, eventually that database is going to grow and they’re going necessarily need to go to a hybrid approach or right to the cloud approach. And I’m just excited to actually get my hands on that tool. I think it comes out in April. And I know I was sitting behind you. I was just as excited. The other thing I’d love to get your thoughts on was Rob talked about the transition from in the cloud to on premise and what will be some stuff they’re announcing soon around private cloud. And the thing that I noticed was when he deployed the app itself, it was deployed from cloud onto his desktop, and in this case he used a Mac but I’m sure it was the same with Windows. It was like quick, bang, done. Yeah. And think about what’s behind their stack, right? So it’s probably a cut-down Hadoop and Spark and R-Studio, Python or some version, probably two or three or both. It’s got say Jupiter notebooks. That’s a fairly complex stack to build in anyone’s language in the cloud. To put it on a desktop in a single, double click whatever installer, and we watched it live. I shared that Aha moment. I think it was really exciting. I can’t wait to get my hands on it. I am excited. My twin brother is actually a data scientist also. Yeah, he works for a large company in Seattle and one of his problems is that it’s hard for him to use tools like this because they’re all cloud based. So now when I go back home and tell him, he’s going to freak out. I know he will. I’m very excited to tell him. What are the odds of two geniuses in one family? Okay, so part of the format of this is that when we get to this point in the podcast, I want to throw a series of things at you for rapid-fire 30-second responses if that’s okay with you? So the three that I’d like to hit you with are things that have just leapt out at me from this particular event at the IBM Interconnect 2017. Number two, Data First. You’ll notice I used an American accent with that not Data First. And number three, Cognitive to the Core, which I’m a real fan of. So in 30 seconds or less if you wouldn’t mind, rapid fire just off the top of your head, take away sort of sense of what you gained from this event, Enterprise Strong, in you are language what does that mean? Well to me, Enterprise Strong means your solutions have to grow with your company and the data it can generate. You start out small, you can use those … like how the Data Science Experience at your desktop, you just can use that. But as you grow as a company, your data will necessarily will have to grow as well, bigger, faster, more complex data. And Enterprise Strong means it’s going to be able to handle all that workload as you expand. Fantastic. Perfect. That’s a Tweet in itself. Number two, Data First. And I know this is a real passion for you and I think you’ve got a screen shot of one of the demos we saw yesterday which I’d love you to talk to in a bit more detail. So, maybe first, just a quick rapid-fire, 30-second thoughts on it and then we’ll wrap back to that for a bit more detail. So Data First, in 30 seconds. Okay, well, to me and maybe to many other people, data are useless unless you do something with it, right? And by something, I mean you can apply analysis to it or some kind of methodology to extract value from it. And what the Data First method does is it gives you a general guideline of how to approach your data. If you want to make a solution, IBM Data First method gives you a step by step process of posing a problem, testing that solution that you built and then deploying it. It’s a cycle and you iterate on that. You have a problem, build a solution, you self-correct, you implement it and so forth. And I like the idea, because oftentimes people get kind of like lost in the weeds of all these different tools that are available to them. What they need is an approach of how do I get these tools together and get value out of that. I think the Data First method is a good approach that lets you do that. And I think yesterday, when we were there and they were demoing it, they effectively tagged it as an agile methodology for data, yeah? Yeah, I see it. To me, I look at the Data First method and I like it because to me it reminds me of the scientific method, where it helps you think critically about your problem you’re trying to solve. Because when you analyse data, you don’t just analyse it just to analyse it. You want to solve something. In the scientific method, you start with a problem statement, you generate hypotheses, you gather the data to test those hypotheses, then you either deploy an algorithm or communicate the results to the executives who make changes to your business. And just like the Data First method, it gives you some structured approach on how to do that. And I like that a lot. Because oftentimes, people are just lost with the tools that they hae at their disposal. And they don’t know where to start, right? No, I agree with you totally and I’m a huge fan of it. Third one, Cognitive to the Core in 30 seconds if you can. Just your general sense of Cognitive to the Core. To me, it means using analytics in all aspects of your business. From coding your data to analysing your data to deploying models, you need to … every system on this planet can be defined with numbers, right? We are a quantified world, and the way to get value out of that is to apply analytics. And since there’s not a million data scientists in the world, we need to rely on machine learning abilities to just automatically give us those insights. And to me that’s Cognitive to the Core. Fantastic. That’s a really great wrap. I’m really keen to get a bit more insight to you. What would you say drives you? What’s your greatest passion in life and work? And could you perhaps share a little bit about what you’re working on at the moment in that context? Sure. Well, what drives me is, first of all, always be nice to people and also, try to help people get more value out of the data that they’re given, or even information that comes across their face. We live in a world of fake news now, and I’d like to be able to give people the tools to think critically about information they’re given. And that’s what excites me. That’s why whenever I … at these conferences, I share my ideas, but I also share the results of my studies that I do. I want to base my opinions on things that are factual and things that I’ve done. For example, a year and a half ago, I did a study on data science just to understand what is data scientists and what do they do and what is the practise of data science? And so, I did a series of blog posts on that, articles and it was well received. And now, I’m working on best practises in customer experience, customer success programmes. You know, a lot of pundits say you should do x, y, and z to have a really good programme, but I want to be more rigorous, so I did a study to identify companies that viewed themselves as top-notch, versus those who don’t, and I want to understand how they differ and how they structure their customer programmes. And what I found was, here are some results that I haven’t told anybody yet. Awesome. An exclusive, I like it. If you want to succeed in your customer experience programme or customer success programme, you need a data platform, because those companies that use that have higher loyalty for the customers. Also, this is great, use machine learning to get insights. Like I said before, not every company has a data scientist on board, so how are they supposed to get value from their data? Well if you give them this tool, a machine learning tool, that just tells you which customers are about to churn, which ones are good opportunity for upsell, they can decorate their Marketo or their sales force application with an information, reach out to those people who you know are at risk and take action. Also, another one is that companies who are more successful, tend to have access to data scientists and data professionals. And that makes sense to me. Because if you don’t, you can’t get value from your data. And those who can get more value from their data, are apt to make better decisions to drive their customers forward. Also, which was really interesting, is that analytical leading companies actually focus their analytics on customer facing issues. They analyse data to understand their customers better, to increase customer loyalty. Analytical lagging companies tend to focus more on internal facing processes like cost reduction and resource allocation. So if you want to get value from your data, make sure you’re analysing data in a way that affects the customer relationship. It makes you understand the customer better. No, I like that. There was actually … I don’t know if you’ve read it, or if you haven’t I would love to share it with you. There was a paper that was published by IBM probably five or six years ago at least, under the title of The Era of Smart. And it was … it preceded the whole analytics and big data thing. But what they did is they took data, financial data in particular and performance data from about 4,000 companies from around Australia, fed it through the Australian School of Economics, and said just tell us what insights you can gain. The executive summary was like 75 pages, so it was a tome, right? But there was one line that you just reminded me of that I wanted to throw in there and get your thoughts on and that was what they found was that companies that leveraged technology and take advantage of technology early, get such a competitive advantage over their competitors. Invariably, their competitors don’t actually catch up. And I think that kind of goes to what you just said and that is, if you’ve got data and those data are assets, essentially treated like an asset, and put some KPIs on it and give it a value and even put in in your balance sheet if you want to and if you can gain some competitive insight from that, then you are quantum years, leap years ahead of … leaps and bounds ahead of your competitors potentially, who are not even thinking about it, right? And I think that’s kind of what you just summarised there. And that’s obviously what you’re seeing from both your research and your day to day practitioning and applying that science. That’s exactly right. That’s exactly right. If you’re able to extract insights and get value from your data a year earlier than your competitors, you are so far ahead. If you already know the value of, not only descriptive analytics but predictive and prescriptive, you are seriously light years ahead of your competition. If they’re still stuck with just looking at run charts or little like monthly metrics, if that’s all they’re looking at, you’re going to win as a competitor. Well, in fact, we covered it earlier in another discussion this morning where we talked about the difference between a company that turns up with printed copies of colour power point printouts and pie charts or whatever the crap, diagrams that were like a month old or last month’s performance data trying to make decisions on next month versus someone who turns up with a large format tablet or an iPad and is getting real time dashboard analytics on what is happening right now. So whilst you’re sitting in a meeting for sales and marketing or in the board room, they can actually see the pulse of the business right now. And that’s such a competitive advantage in my view. And you clearly believe that based on what you just said now that it’s almost impossible to put into words, you have to show people the benefit of real time information and the finger on the pulse of their own data and their own performance and their own business and particularly around the customer experience piece, because we’ve seen this whole celebrity experience thing come about now. Where people have kind of, through the smart phone and the internet have wrestled control of their data and wrestled control of that customer experience now so that people talk about this celebrity experience, right? What does it look like in your world now? You’ve done a lot of work around that whole CX space. Do you think people have come to grips with it and grasped it yet and understood it’s a requirement, or do you think they’ve missed that boat? What’s the general sense around that? I mean in your local market and North America in particular. Because you’ve got a very rapid moving economy. Well that’s a very good question. As my role as Chief Research Officer at Appuri, our goal is to help our clients identify which customers they’ve got to churn because of our upsell and so forth, and although our clients can appreciate that, they have no idea how to do that. And so my goal is … my role there at Appuri, is I want to educate them on why you need us to help you do this. We have awesome data scientists, awesome customer success managers, great staff of people, and I want to communicate to them why you need, maybe not us, but why you need machine learning to leverage that. Because your customers are going to have higher and higher expectations about service delivery because your competitors are giving it out, right? And if you don’t keep pace with that, you are dead. What I’m saying, just history. If we look at some of the companies that just didn’t, AOL for example with their email and you’ve got mail. I hate to say it but the reality is they didn’t pivot when the internet came along. Right, and they supposedly caught up now. And we’ve seen that everywhere. And yet we’ve seen the companies like Uber and Airbnb an others where, Uber doesn’t own any taxis. They’re a data company and yet they blitz the taxi industry, right? Airbnb, there story goes on. There’s lots of them. You’ve got Apple and Google who are the biggest software companies in the world and they don’t actually write the software, it’s all the data. I want to just quickly circle back if we can before we run out of time. There are some key event things that we spoke about before we kicked off here that yo mentioned that you were interested in just covering and I’m really keen to get your insights on them. I’m going to just quickly cover them and then come back to them. So, the first one was the concept of making data simple and accessible to the world. The second one is empowering people and teams in new ways on platforms like the Data Science Experience and particularly when they’re going to have the blend of … kind of bimodal mode if you like, on-prem, off-prem and particularly on the desktop. And the third one is the Watson machine learning service or Watson machine learning in particular. In a few minutes, if you could just give me a wrap up on each of these. So making data simple and accessible for the world in your owns in your own mind, what does that actually mean in plain English for people listening in? Right, well, to me, it all comes down to machine learning really, because if you’re not educated on statistics, then you really can’t make very good decisions looking at data. And what machine learning will help you do is it will do the hard work for you and give you the insights you need. And that’s what makes data accessible. If you could have a tool like IBM Watson, that can do that, that’s based on machine learning … it’s amazing, I was privileged enough to be at the IBM Watson release a couple of years ago and I remember watching them with natural image processing, you can actually just type in a question of your data, like what’s the biggest driver of sales, and boom, it will tell you based on your own data. Visually, with numbers, it was fascinating. My jaw literally dropped open. I was amazed. I had the same experience. I looked at it and realised that this had lowered the barrier to entry to the point where there was no barrier to entry. And we started with H&R Block in fact, we spoke about this earlier in a separate conversation this morning. H&R with their demo yesterday with the keynote, and where the CEO stood up and showed what they’ve done around applying Watson, and the bit that really grasped me based on what you just said there now was the tax consultant just typed the question in plain English. How many cars have you got? How many rooms in the house? It was just plain English questioning, but it could have been done in any language right? It could have been Mandarin, it could be Spanish, it could be Italian, Watson has the ability to grasp the domain knowledge on each language. But the demo is how many rooms in the house? Or something to that effect. And it immediately changed the graph in front of the person, the consumer, so they could start to see the dollars and the numbers change. And so I think you’re right, in my view I think the barrier to entry has been lowered so far that it’s almost non-existent. For those who have got access, and that’s the big challenge, isn’t it is how you provide access to them? Point number two, empowering people and teams in new ways on platforms like the DSX. You sort of covered it in general, but maybe focus on what does it actually mean to empower people and teams, and I guess teams in particular I’m really interested in with the collaborative piece that we’ve heard a lot about, again in your own words what does it mean to you and what you’re doing in day to day practise? And what I found was that you need different kinds of skill sets for the one problem and so for example there’s basically three kinds of data scientists. There’s the subject matter expertise, who knows the content domain for example if you’re running business, you need a business expert. If you’re trying to have data on cancer, you want an oncologist on your team. The next kind of data scientist you need on your team is a programmer or developer, someone with technical skills who can get access to the data. And finally you need somebody with stats and math skills who can actually crunch the data and make sense of it all. So the Data Science Experience allows you to work collaboratively across different kinds of data scientists who can focus on a given problem. It’s like you can share data sets with your team, you can share results with your team, bring other data sets and that’s the power of the Data Science Experience, because it brings different data scientists together to solve one particular problem. And it turns me on. Like you, I had the privilege of pre-release early access to DSX, and the thing that I accidentally realised was that I pulled in some data … I actually took my LinkedIn CSV exported all my contacts. And then I just started using it with a couple of little python scripts I’d written to go and just look them up and update their details and then just graph it and see how often people were logging in and updating their contact details, new jobs, whatever. And then I started poking into people’s Twitter feeds and seeing how often they were posting. And then I realised, hang on, I’m talking to all these different data sets in and out of the platform. I’ve loaded something in there, and then I’m plugging in external sources and then what I did was I showed it to a friend of mine and said, “You’re a better python scripter than I am, can you get the graph to do this?”. And so I actually wrote this blog last year which I think you saw where I described the DSX as kind of the webmailification of data science, right? Because it’s as easy to use as web mail. And like you I can’t wait to get it on the desktop. I think you and I need to work together on a project, because you have really good technical skills that I’ve never seen anybody have. The stuff I’ve seen you do during IBM InterConnect 2017 also blew my mind. That somebody can do these things, like on the fly. It blew my mind. Seriously. We will definitely do some things together. And we’ll blog them and have lots of fun and I’m sure IBM will be grateful to sponsor them. Maybe we’ll do it with the third topic. So Watson machine learning, and we’ve talked about machine learning in a general sense. Would you be able to just drill into the machine learning in itself. It’s available as a service on the Watson data platform. But if you, in plain English go to explain to somebody, let’s imagine a young school kid says, “What’s machine learning?”. What does it mean for a non-technical, non-data science related person that’s outside this domain or sphere of influence. Because it’s a really powerful concept and in many ways it’s a simple concept, but often the simple things are the hardest to explain, right? But I think if anything, if you don’t mind, you’re probably the most qualified I’ve met to explain what machine learning really means in a couple of minutes. It’s funny … machine learning … machines don’t actually learn. It’s the way to build algorithms that help you model what the data are telling you. So you feed the computer a bunch of data, right? And I think the most popular algorithms used, this is based on a KD Nugget survey, is regression. You have a bunch of predictive variables, you want to predict and outcome. What you do is you feed this computer a bunch of data with those variables in it and then it’s going to model that. It’s going to tell you which predictors are the best predictors of this outcome that you’re interested in. That outcome could be a continuous variable, it can be a dichotomous variable like churn, no churn. So the machine learning is a way to help you learn which variables are predictive of your outcome. And that’s called supervised learning. Another kind of machine learning is unsupervised, where you just give it data and you say, for example a factor analysis. You just give it 20 questions that are on a survey, and you say, “How many clusters do these questions form?” Or “How many constructs are bing measured by these 20 questions?”. And based on the correlations among all these variables, it will tell you these are the pockets of variables that kind of hang together. And that’s unstructured because you’re not telling it how to form these clusters. You’re saying these clusters exist in your data. So it’s just telling … it’s teaching your computer … it’s teaching you what’s real, what’s not real, showing you structure out of your data, whether it’s supervised or unsupervised. It’s pretty powerful stuff. Like I said, it’s just stats on steroids. In fact, my advisor in my PhD, right? So I do factor analysis with IBM SPSS. I push a button and it’s done, right? For his dissertation, he basically did machine learning on a calculator. He did a factor analysis for his PhD with matrix rotation. It blew my mind. Yeah. And that was his dissertation. Nowadays, you do it with a push of a button. So, it’s not really machine learning, it’s applying statistics to your data and giving it … the more data you give your algorithm, the better it’s going to be. And I think one of the things that I often struggle to convey to people when it comes to the core concept of machine learning, is it’s kind of like there’s a feedback loop in many ways. And that is if you take an algorithm, and it’s kind of like the chaos theory and the Mandelbrot graph, right? That you could take the same thing and just feed the number through it over and over. You get this beautiful graph that you could continue to dive in and out of and it’s almost goes ad infinitum, right? One of the things I love doing is taking a really simple algorithm, and applying it to data and finding things like outliers and working out why are they an outliers, why is this thing way out to the left-hand side, and why is this right at the top? And then you find out, oh, it’s just bogus data, I didn’t wrangle it properly versus that’s just a 63-year-old person who should not be doing this 10K run. But then also feeding that back into itself and continually training it to refine and refine. And that’s the thing that really excites me is that you can build a really simple model of a simple algorithm, and the more you run it over the same data set, the more to learn about it, the better it gets at telling you what you want to find. And the thing that … you touched on one key point which I’m going to just quickly dive into for my own purposes is that when you talk about making data accessible, I see machine learning as something that is going to be under the hood, and buried in the guts of the machine, and so most consumers won’t ever really touch machine learning directly. As you said, it will be the push of a button. And I think that goes through everything that we build. Now when we talk to Siri, we don’t see the pseudo-AI behind it, it’s just text to speech, speech to text. And I think this is where machine learning is struggling to get a foothold on the brand and marketing, because most people re never going to see it, they’re never going to experience it other than just in the outputs and so forth. So, quickly, I know we’re running out of time. I want to wrap up with a couple of quick things. We touched on it earlier on, but I’d like to just circle back to it, particularly around the application of it. 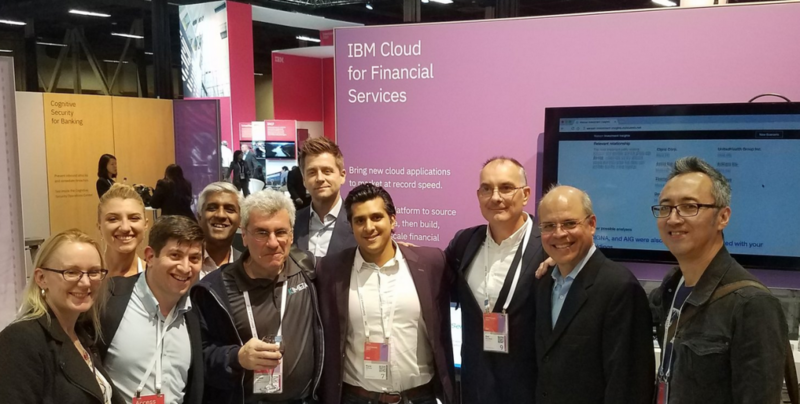 For folks who couldn’t make it to the IBM Interconnect event this year in 2017 here in Las Vegas, if you could just in a minute or two, give us your quick thoughts on the Make Data First method, specifically how does it help you get value from your data? So that framework and methodology of going and discovering the data and understanding it and getting inside. If you were going to paraphrase that for key takeaway to wrap up in, in agile sense in many ways, how would you paraphrase that to a non-commercial, non-technical person who is just trying to grasp the concept if they’re listening in? Sure. I think the main purpose of having the Data First method or using that method is that it will help you clarify up-front what you’re actually doing with your data. What’s your goal? You need to have a goal when you approach your data. With not goal, you will shoot aimlessly forever, and you will be stuck in a cycle of just continuously analysing your data. So you have to understand what is your purpose for analysing your data, and go from there. And this work … they hold a workshop for you for IBM and they help you clarify that. They bring all different kinds of data scientists together or data experts together in your company, like I said, you need a team of data experts, the subject matter expertise, the technology expertise and the stats expertise. Get them in a room together and start solving a problem. Not just a general, “Let’s get better.” But are you trying to reduce churn, are you trying to increase revenue? Have a purpose and develop a solution around that problem. I like that. I’ve actually written it down. I wrote down what you just said because I want to do a blog with it, with you on it. What is the purpose of your data? I think that’s the gem out of all of this more than anything. Really quickly, because we’re getting wrapped up, and it is a pun, so forgive me, but what’s on the horizon for the rest of 2017 in your mind from the takeaway that you’ve had from this last couple of days here in IBM Interconnect 2017? Just the next six to eight months? Predictions annoy me normally, but I can generally see sort of the 90 or 180 day ahead. In your world, from what you’ve seen this week, what’s on the horizon? Well for me, and it’s really always about me really. Of course it is. That’s why we’ve got you here. The thing that I take away from this is that I’m looking forward to, first of all, looking at the Data Science Experience on my desktop and sharing it with my colleagues at Appuri. And also, I’d like to look at that tool and see how it can impact data scientists and then I want to design another follow-up study on data scientists to see if the use of these kind of tools actually makes the data science team more productive. Wow, what a a great line to wrap up on. Bob, we’ve only just got to know each other in real life. We’ve known each other quite a while online. It’s been such a pleasure to do this podcast with you. I’ve had such a fantastic week with you guys. I can’ wait to do it again. Thanks so much for joining me and thanks so much for your time on this. Thank you very much. Nice to be here.